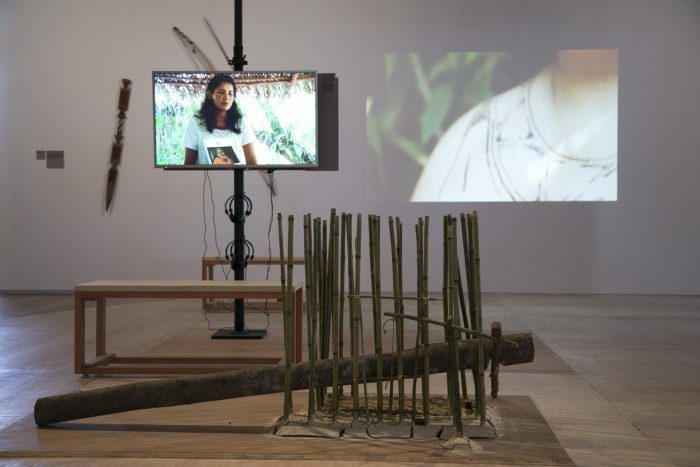 Through the exhibition «Dja Guata Porã: Rio de Janeiro Indigena», the curators Sandra Benites and Pablo Lafuente reflect on the discursive powers and agencies that the indigenous communities of Brazil can achieve from exhibition and institutional devices, and question the concept of the art object in the production of these communities. A partir de la muestra «Dja Guata Porã: Río de Janeiro Indígena», lxs curadorxs Sandra Benites y Pablo Lafuente reflexionan sobre las potencias discursivas y los agenciamientos que las comunidades indígenas de Brasil pueden llegar a tener desde el dispositivo expositivo e institucional, y así cuestionar el concepto de objeto artístico frente a las producciones de estas comunidades. 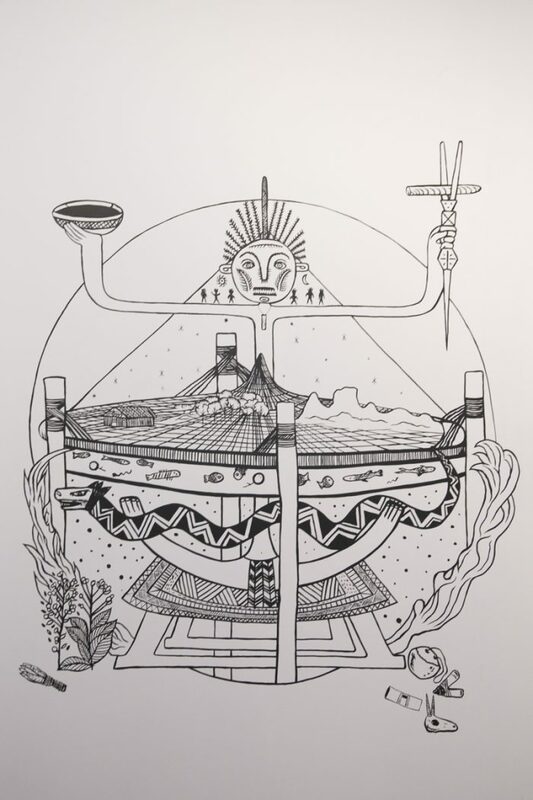 Dja Guata Porã: Rio de Janeiro Indígena is an exhibition being presented at the Museu de Arte do Rio from May 16, 2017 to March 25, 2018. 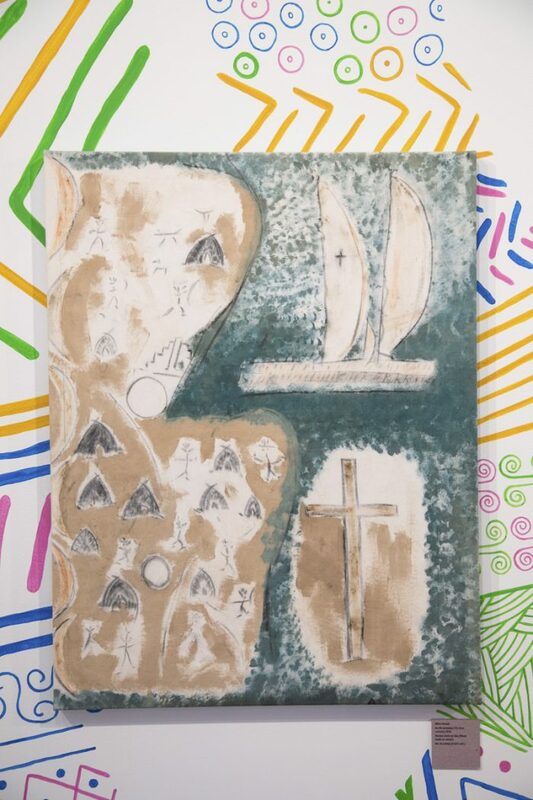 It was a collective and collaborative project constructed among the indigenous communities of the state of Rio de Janeiro and representatives of indigenous communities from other regions such as Josué Kaingang, Anari Pataxó and Edson Kayapó, along with a curatorial team made up of Clarissa Diniz, José Ribamar Bessa, and the authors, as well as a group of researchers, in conjunction with the museum’s permanent teams. The project was built through a series of encounters that began in 2016 at the museum and in villages located in Rio. The encounters were built around general and specific topics (such as indigenous visions of what we might call art or the roles of indigenous women currently inside and outside their communities) and brought together approximately 30 to 40 people, indigenous and non-indigenous, to talk about the thematic process or the structural aspects that would give shape to the exhibition. All based on the single conviction that the museum cannot treat issues, cultures, or indigenous people and groups the same way that it treats Western notions of art, the artist, or the public. For this, we opted for a format that seemed obvious to us: to meet up to talk about what could and should happen; to think in a group, from different positions, about what to do together. All of this after deciding whether doing-together would make sense because the need—or perhaps simply the convenience—of that presence should not and could not be decided before it began. In Brazil, indigenous peoples are little recognized by the majority of the population, and it is not uncommon to hear stories of discrimination or total ignorance. Stereotypes of “generic Indians”  constantly appear in school books and in the media, as if they were “beings from the past,” and very few instances show particularities such as the linguistic or cultural diversity of the approximately 300 distinct indigenous communities that exist today in Brazil. For this reason, we believe it is necessary for indigenous people to occupy the spaces of museums, universities, and libraries. 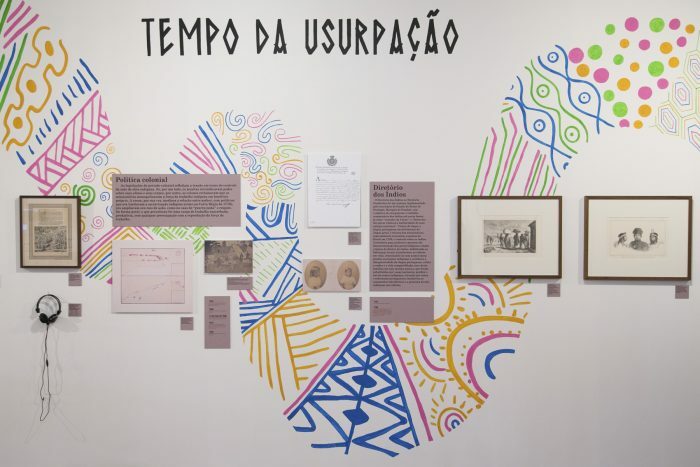 Hence the decision to occupy the Museu de Arte do Rio in order to try to show the multiple realities of the indigenous peoples of the state of Rio from their perceptions and complexities. To avoid being co-opted or paralyzed, we did not pretend to be ignorant of the interests and dynamics present at the museum, but rather we made use of the museum as one more instrument. Despite the existence of some academic researches made by members of indigenous communities in Brazil today, the presence of these perspectives does not seem sufficient for the invisibility persists. That is why we believe that it is fundamental to promote the cultural production of indigenous peoples from a position of prominence; in the curation, graphic design, visual identity, mediation activities, public events for the elaboration of materials, the works or art, the exhibition guaranteed indigenous presence in (almost) all areas. Residing in the city of Río, and contributing to the exhibition, there are approximately 17 different indigenous groups and non-indigenous  (jurua as they are known in Guarani) working for the museum as educators, producers, curators, researchers, or invited by the museum to contribute to the project. 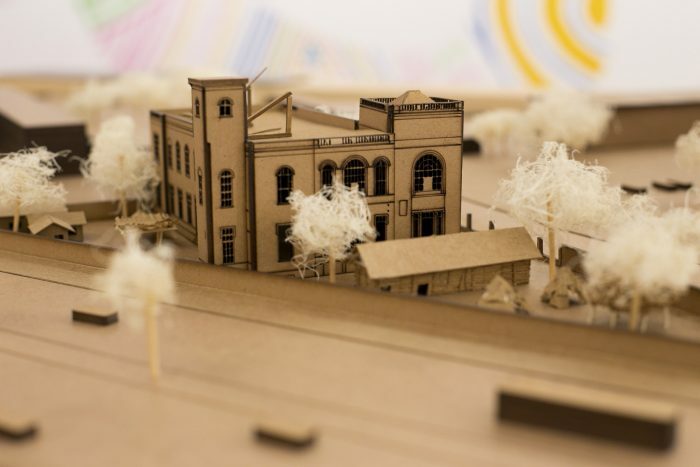 During the planning and construction process of the exhibition, apparent differences arose between Guarani and Pataxó, who live in villages, and Puri indigenous people living in more urban contexts . This heterogeneity contrasted processes, structures, requirements, ways of doing, and ways of presenting expectations and rewards. Achieving this collaborative experiment required luck. The first artistic director departed before beginning the process and the second had other concerns and did not pay enough attention. Likewise, self-critical attitudes were also needed from the beginning through to the final results to allow for collective decision-making processes. We started from our experiences as indigenous, anthropologists, mediators, and organizers to build bridges between conflicts and to seek common sensibilities, inspired by a text in Guarani: “walk collectively, and build that path while walking.” This text inspired part of the title of the exhibition. We had to discuss without forgetting the teachings and thoughts of the other members in order to understand their teko [way of being] . 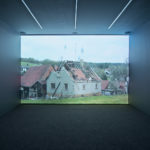 Several explanations were needed from both sides: with members of the villages, this involved communicating details and logic of the museum: economic, symbolic, and operational. With the non-indigenous institution and teams, it involved introducing other ways of being, ways of approaching, other possible temporalities, visions, and economies. In this process, there were misunderstandings and also desperation when faced with the obligation to frequently respond to complex demands and not to resolve conflicts between thoughts (because that would be impossible), but to make decisions collectively. For this, it was important to consider different ways of seeing things, without eliminating or rejecting individual perception, but rather to share ideas and collective agreements. Despite that, or maybe for that very reason, it was a challenge. We understand that it will always be like this: to consider and respect the rhythms, formats, ways of exchanging in each of the meetings, give shape to different paths and ways of walking, and to always question the structures that confront our differences. These walks were translated from the realities and experiences of each individual person. When they are set free, they demonstrate disagreement and conflict and we believe this can be found in the exhibition. To achieve this as curators, it was necessary to learn to listen, to listen to the demand of rights of the indigenous peoples, to clearly pronounce and show themselves, taking care of their own words and doings. To avoid misunderstandings caused by images without context, several angles were shown, and we tried to avoid reinforcing the prejudices in the eyes of those who do not recognize indigenous ways of being, customs, and languages. Moreover, although the objects are important for the native groups, we avoid privileging them so as not to reduce the communities to their material culture, as many of the jurua museums do. In this way, special attention was given to oral histories, thinking about how to dialogue and with whom so that the act of exposing oneself to others, an already difficult act, made sense. Even if we tried to approach the Guarani practices from what the whites call, or we call, “art,” many precisions, adjustments, and reservations were required. For the Guaraní, the artistic questions are related to the abilities of each person and also to the specificities of each village, of each group. That is why it is necessary to discuss, from the point of view of the village or group, the realities of its existence, and see what the implications might be. To listen to what must be shown and how it should be shown, without letting the most significant thing get lost along the way. The Mbaraka Mirim, for example, is a sacred instrument for the Guarani, and the jurua call it a rattle or pumpkin cowbell. The Mbaraka is simple, not flashy, and is used in prayer. To being-sacred refers to a form of use at a particular time. As tembiapo (art), the Mbaraka is the result of a person’s work, as a small wooden figurine. Each particular skill or work is considered equal: to know how to sing, to speak in public, to pray, or to play instruments. Every person becomes an artist by their ability, by their particular gift, and whatever they do can be sacred. However, it is not possible to define exactly what is and is not art, for there is no separation or hierarchy between skills. So, any attempt to show an object requires the consideration of the processes of its production in relation to the particular history and place where it is were carried out. In this case, in a museum (MAR), a city (Rio), and a specific country (Brazil), for which indigenous people are not only not considered artists, but simply are not considered. Today, two years later—and with the transition from a government that was the result of an administrative coup, to a government resulting from an electoral process characterized by massive illegally financed defamation and disinformation campaigns—indigenous peoples are perhaps more visible. Although perversely, through the point of view of a government that despises them and seeks their disappearance. If we were to begin again the process that gave birth to Dja Guata Porã, we would need to do some things differently. However, there would certainly be a constant: the protagonism. 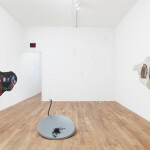 This is to have at the center of the process the original communities and everything that this implies, within the institution and the art world—the conflicts, the negotiations, the inability of our own resolve as well as the will to build that road together, as the indigenous peoples did long before the arrival of the Europeans. Sandra Benites is Guarani Nhandewa, originally from the village of Porto Lindo, municipality of Japorã in Mato Grosso do Sul. Her Guaraní name is Ara Rete. She is an anthropologist and holds a PhD at UFRJ, in Rio de Janeiro. She was Co-Curator of Dja Guata Porã: Rio de Janeiro Indígena at the Museu de Arte do Rio (2017-18). Pablo Lafuente lives in Rio de Janeiro, where he is the coordinator of the CCBB’s educational program. He was co-curator of the 31st São Paulo Biennial in 2014, and co-curator of Dja Guata Porã: Rio de Janeiro Indígena at the Museu de Arte do Rio (2017-18). Generic Indian refers to an image projected over all the members of indigenous peoples in Brazil, without considering the differences between existing peoples or be- tween individuals in a specific circumstances. Some of them were familiar with the indigenous realities of Rio or Brazil; others had no contact or experience. Puri live in cities, in a movement of resurgence and reconstitution as a people. “teko is the Guarani way of being, ‘the ethical-moral system, the set of principles, norms, and laws which guide a community’ (pg. 869)”. From Urt, João Nackle. “How Western Sovereignty Occludes Indigenous Governance: The Guarani ad Kaiowa Peoples in Brazil”, Contexto Internacional 38, no. 3 (2016): 865–886. 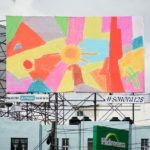 Dja Guata Porã: Rio de Janeiro Indígena, exposición presentada en el Museu de Arte do Rio, del 16 de mayo de 2017 al 25 de marzo de 2018, fue un proyecto colectivo y colaborativo de construcción entre comunidades indígenas del estado de Río de Janeiro y representantes de comunidades indígenas de otras regiones, como Josué Kaingang, Anari Pataxó y Edson Kayapó, en conjunto con un equipo curatorial compuesto por Clarissa Diniz, José Ribamar Bessa y nosotrxs dos, así como un grupo de investigadores, además de los equipos permanentes del museo. El proyecto se construyó por medio de una serie de encuentros que comenzaron en 2016 en el museo y en aldeas ubicadas en Río. 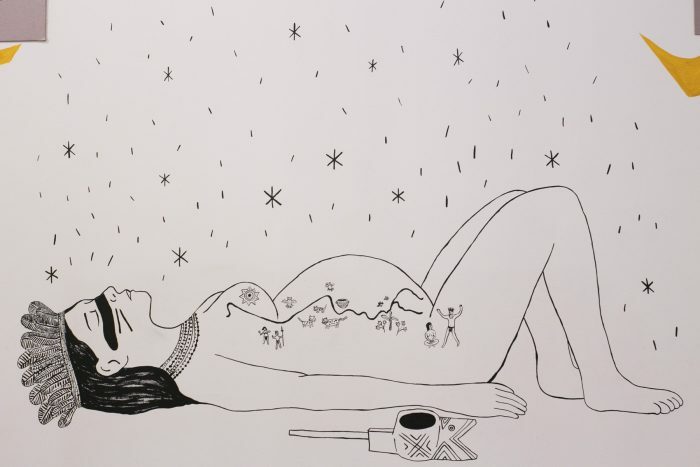 Los encuentros sobre temas generales o específicos —tales como visiones indígenas de lo que podríamos llamar arte, o los roles de las mujeres indígenas actualmente dentro y fuera de sus comunidades— reunían aproximadamente a treinta o cuarenta personas, indígenas y no-indígenas, para conversar sobre aspectos temáticos, de proceso o estructura, que darían forma a la exposición o serían desarrollados en ella. Todo con base en una convicción: la imposibilidad de pensar que el museo puede tratar cuestiones, culturas o personas y grupos indígenas como trata lo occidental y sus nociones de arte, artista o público. Para ello, optamos por un formato que nos resultó obvio: reunirnos para hablar de lo que podría y debería acontecer; pensar en grupo, desde posiciones diferentes, sobre qué hacer juntxs. Esto después de decidir si hacer juntxs tendría sentido, porque la necesidad —o tal vez simplemente la conveniencia— de esa presencia no debía y no podía estar decidida antes de comenzar. En Brasil las poblaciones indígenas son poco reconocidas por el grueso de la población, y no es difícil oír relatos de discriminación o de total ignorancia. En los libros escolares y medios de comunicación aparecen constantemente estereotipos de “indios genéricos” , como si fueran “seres del pasado”, y pocas instancias muestran particularidades como la diversidad lingüística o cultural de los aproximadamente 300 pueblos indígenas que hoy existen. Por eso mismo, creemos necesario que los indígenas tomen el espacio de museos, universidades y bibliotecas. 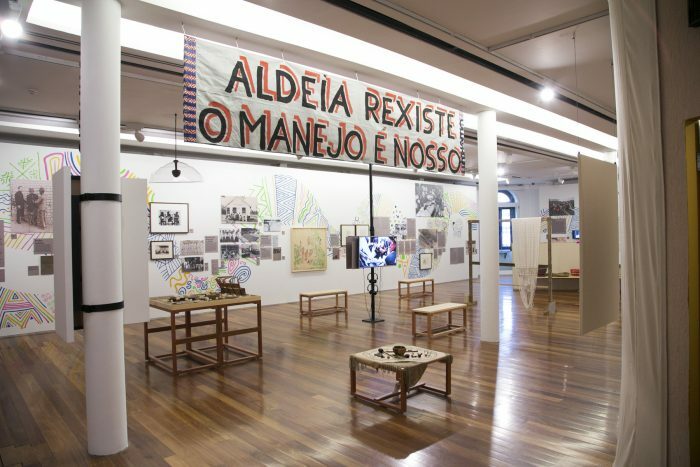 De ahí la decisión de ocupar el Museu de Arte do Rio, para procurar mostrar las múltiples realidades de los pueblos indígenas del estado de Río desde sus percepciones y complejidades. Sin inocencia respecto a intereses y dinámicas presentes en el museo, pero también evitando que el cuidado necesario —para no ser cooptado— nos paralice, porque el museo es un instrumento más. A pesar de existir hoy en Brasil algunas pesquisas académicas hechas por miembrxs de comunidades indígenas, la presencia de estas perspectivas no parece suficiente pues la invisibilidad persiste. Es por eso que asumimos fundamental promover la producción cultural de indígenas desde una posición de protagonismo, garantizando su presencia en (casi) todas las áreas de trabajo de la exposición, desde la curaduría al diseño gráfico e identidad visual, hasta las actividades de mediación y eventos públicos para la elaboración de materiales —obras o, si queremos, arte— que fueran exhibidos. Durante el proceso de planeación y construcción de la exposición, se conjugaron obvias diferencias cuyas implicaciones no eran tan claras entre guaraníes y Pataxó, quienes viven en aldeas; indígenas Puri en un movimiento de resurgencia, de reconstitución como pueblo; indígenas viviendo en contextos urbanos, de aproximadamente 17 etnias diferentes, residentes en la ciudad de Río temporal o permanentemente; y no-indígenas (jurua como se les dice en guaraní), trabajando para el museo como educadorxs, productorxs, curadorxs, investigadorxs, o invitadxs por el museo para contribuir a ese proyecto. Algunxs de ellxs estaban familiarizadxs con las realidades indígenas de Río o Brasil, otrxs no tenían contacto o experiencia alguna. Dicha heterogeneidad puso en contraste procesos, estructuras y requisitos, modos de hacer, y modos de presentar expectativas y retribuciones. Lograr este experimento de colaboración requirió de suerte (como se reflejó en la salida de un director artístico antes de comenzar el proceso, y la entrada de otro que, con otras preocupaciones, no prestó la atención suficiente). Así mismo, también se necesitaron actitudes autocríticas que permitieran entrar en procesos de decisión colectiva sin definir, desde un principio, el resultado final; una intención que encuentra su punto de partida en un texto en guaraní, que forma parte del título de la exposición: caminar colectivamente, y construir ese camino al andar. Partimos de nuestras experiencias como indígenas, antropólogxs, mediadorxs y organizadorxs, como puentes entre conflictos que buscan construir sensibilidades conjuntas, dialogando, pero sin olvidar las enseñanzas y pensamientos de origen para así comprender el teko (modo de ser) del otrx. Fueron necesarias varias explicaciones de ambos lados: con miembrxs de las aldeas involucradas para comunicar detalles y lógicas del museo —económicas, simbólicas y operacionales; y con la institución y sus equipos —lxs no-indígenas— para introducir otros modos de ser y de aproximarse, otras posibles temporalidades, visiones y economías. En este proceso hubieron malentendidos y también desesperación frente a la obligación de responder a demandas frecuentemente complejas; no para resolver los conflictos entre pensamientos, porque eso no sería posible, sino para tomar decisiones colectivamente. 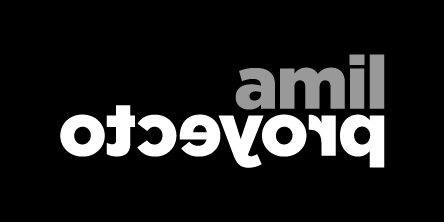 Para ello, lo importante fue considerar no sólo una forma de ver las cosas, sin eliminar o rechazar la percepción individual, y más bien compartir siempre las ideas y acuerdos pensados en conjunto. A pesar de eso, o tal vez por eso mismo, fue un desafío. Entendemos que siempre será así: considerar y respetar los ritmos, formatos, modos de intercambiar en cada uno de los encuentros; dar forma a caminos y modos de andar diferentes, y siempre cuestionar las estructuras que intentan evitar esa confrontación. Porque esos caminares —trazados a partir de realidades y experiencias individuales—, si se dejan libres, siempre muestran desencuentro y conflicto, y consideramos que éstos podrían encontrarse en la exposición. Para ello, como curadorxs, fue necesario aprender a oír, escuchar la exigencia de derechos por parte de los pueblos indígenas, para enunciar y mostrarse, agenciándose de sus propias palabras y haceres. Para evitar equívocos provocados por imágenes sin contexto, se mostraron varios ángulos y se evitó reforzar los prejuicios en las miradas de aquellxs que no reconocen lo indígena y sus particularidades, costumbres y lenguajes. Y, aunque los objetos sean importantes para los grupos originarios, evitamos privilegiarlos para no reducir dichas comunidades a su cultura material, como muchos de los museos de jurua hacen. De esta forma, se dio especial atención a la historia oral, pensando en cómo dialogar y con quién, para que el acto de exponerse frente a otrxs, un acto ya de por sí difícil, tuviera sentido. Incluso si intentáramos abordar las prácticas guaraníes desde lo que los blancos llaman, o llamamos, arte, son muchas las precisiones, los ajustes, y las reservas que se requieren. Para lxs guaraníes, las cuestiones artísticas tienen relación con las habilidades de cada persona y también con las especificidades de cada aldea, de cada grupo. Por eso es necesario discutir, a partir del punto de vista de la aldea o grupo en cuestión, las realidades de su existencia, y ver cuáles podrían ser las implicaciones; escuchar aquello que debe ser mostrado y cómo debe ser mostrado, sin dejar que lo más significativo se pierda en el camino. El Mbaraka Mirim, por ejemplo, es un instrumento sagrado para lxs guaraníes, y que lxs jurua llaman sonajero o cencerro de calabaza. El Mbaraka es simple, no llamativo, y es utilizado en el rezo. El ser sagrado se refiere a una forma de uso en un momento particular. Como tembiapo (arte), el Mbaraka es el resultado del trabajo de una persona, como lo puede ser una pequeña figurilla de madera. Esta labor es una habilidad particular entre tantas que se entienden por igual: saber cantar, hablar en público, rezar o tocar instrumentos. Toda persona se convierte en artista por su habilidad, por su don particular, y lo que hacen puede ser sagrado. Sin embargo, no es posible definir exactamente lo que es y no es arte, porque no hay separación ni jerarquización entre habilidades. De manera que cualquier intento de mostrar algún objeto requiere la consideración de procesos de producción en relación a la historia particular y al lugar en el que se llevaron a cabo: en este caso, en un museo (MAR), una ciudad (Río) y un país (Brasil) específicos, para los cuales los indígenas no sólo no son considerados artistas, sino que simplemente no son. Hoy, dos años después —y con la transición de un gobierno que fue resultado de un golpe administrativo, a un gobierno resultante de un proceso electoral, caracterizado por campañas masivas de difamación y desinformación financiadas ilegalmente—, los pueblos indígenas son tal vez más visibles, perversamente, a través del punto de mira de un gobierno que les desprecia y busca su desaparición. Por eso, si estuviéramos por comenzar de nuevo el proceso que dio origen a Dja Guata Porã, precisaríamos hacer algunas cosas de diferente manera. No obstante, habría con certeza una constante: el protagonismo. Esto es tener al centro del proceso a las comunidades originarias y todo lo que ello implica, al interior de la institución y del mundo del arte —los conflictos, las negociaciones, la incapacidad de resolvernos—, así como la voluntad de construir ese camino conjuntamente, como los pueblos indígenas hacen desde mucho antes de la llegada de los europeos. Sandra Benites es Guaraní Nhandewa, originaria de la aldea Porto Lindo, municipio de Japorã en Mato Grosso do Sul, Brasil. Su nombre guaraní es Ara Rete. Es antropóloga y cursa el doctorado en la UFRJ, en Río de Janeiro. Fue co-curadora de Dja Guata Porã: Rio de Janeiro Indígena en el Museu de Arte do Rio (2017–18). Pablo Lafuente vive en Río de Janeiro, donde es coordinador del programa educativo del CCBB. Fue co-curador de la 31a Bienal de São Paulo en 2014, y co-curador de Dja Guata Porã: Rio de Janeiro Indígena en el Museu de Arte do Rio (2017–18). Indio genérico se refiere a una imagen proyectada sobre todxs lxs miembrxs de los pueblos indígenas en Brasil, sin considerar las diferencias entre los pueblos existentes o entre los individuos en circunstancias específicas.